IELTS Academic Writing Task 1 Model Answer – Tables – Secondary School Attendance between 2000 and 2009. 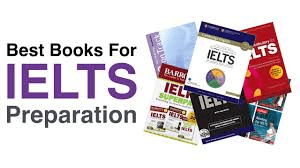 Home IELTS Academic Writing Task 1 Model Answer – Tables – Secondary School Attendance between 2000 and 2009. The table shows the proportion of pupils attending four secondary school types between 2000 and 2009. The table illustrates the relative numbers of enrolment number in 4 types of secondary schools for 3 years: 2000, 2005, 2009. Overall, the proportion of pupils attending voluntary - controlled schools decreased considerably over the time period, while enrolment in community schools showed a drastic rise between 2000 and 2009. In the year 2000, more than half the students (52%) were attending a voluntary - controlled school. However, that number fell to 38% and 20% in the years 2005 and 2009, respectively. In contrast, enrolment in community schools sky-rocketed over the same time period, rising from 12% in 2000 to 58% in 2009. 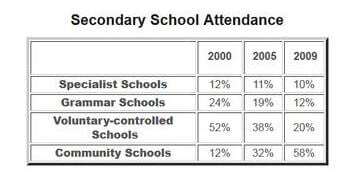 The two other types of secondary schools showed less drastic patterns in attendance over the time period. While they both registered a small decrease, that trend was negligible for specialist schools (decreasing by only 2% over 9 years). However, enrolment in grammar schools halved over the time period, from 24% in 2000 to 12% in 2009. IELTS Academic Writing Task 1 Model Answer - Maps - Illustration on how the village Stokeford changed over an 80-year period.IELTS Writing Task 2 Model Answer: Discussion on the benefits of international tourism and its impact on the environment.